Hatters boss Nathan Jones believes his young squad are a year behind the likes of Doncaster, Plymouth and Portsmouth who have now secured the top three spots in League Two this season. 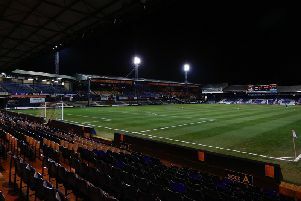 Luton’s failure to beat Mansfield on Easter Monday, coupled with wins for both Argyle and Pompey means if Town are to be playing League One football next season, they will have to do it through the play-0ffs. I love my group, they’re a good group, but we want to improve on all levels, so we’re constantly evaluating who we take forward. When asked if he was disappointed to have fallen short of his top three ambitions, Jones said: “No, I want us to realise where we’ve come from. “Yes, I wanted us to go up automatically. My goals were to win the league, or to go up automatically but we haven’t been able to do that. “But there’s sides who have gone up and congratulations to all three because regardless of their budget, or anything like that, which has helped, they’re sides who have been together. “So they’ve been able to get experience of the level and are further down the line than where we are. “Doncaster have come down and have got a fantastic squad, Plymouth and Portsmouth have been together for two years now in terms of the recruitment they’ve had and they’re an experienced group, both are. “What we want to do is try and get up as next year we’ll be a good side whatever league we’re in. “Hopefully we can get up through the play-offs and it will benefit the young group we’ve got. “But we’re a year behind them in our recruitment, in terms of everything, transforming into the side we want, the squad we want, it’s a work in progress, and that will continue. “Now if we go up through the play-offs then we’re a year ahead of them. “They’re a young group, a good group, but a young group, and we’re evolving. “There’s a long way for us to go before we become a complete side where we’re really at it and have people that can control and win games regularly but that’s a work in progress. “We’re at the first stage really of that. Jones also strongly hinted that he will be looking to make changes to his playing personnel during the summer to ensure that the squad keeps on the path he has set for them. He added: “We’ve managed to do real good work up until now. I love my group, they’re a good group, but we want to improve on all levels, so we’re constantly evaluating who we take forward and we’re in a good place. “With another window and another summer and a bit more experience for the lads, then we’ll be where they are in terms of squad wise, and in terms of everything. “To come in and to go up automatically would have been fantastic, but we’re a work in progress. From where we were, 18th, to now we’re fourth, I’ll defy anyone to say we’re under achieving.”.